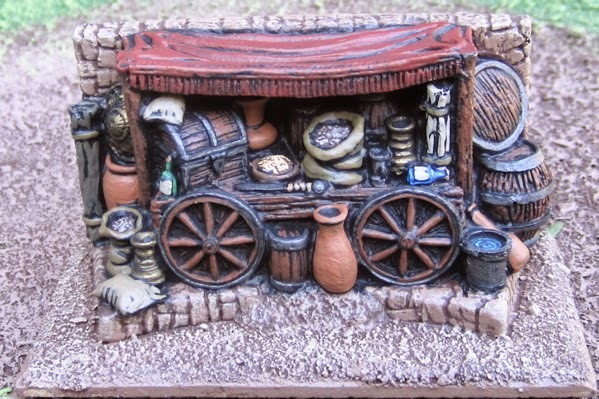 These Market Stands came from Mega Miniatures – I’m not sure they’re available anymore. They came in a pack with the Carpet Stall I painted back in July. 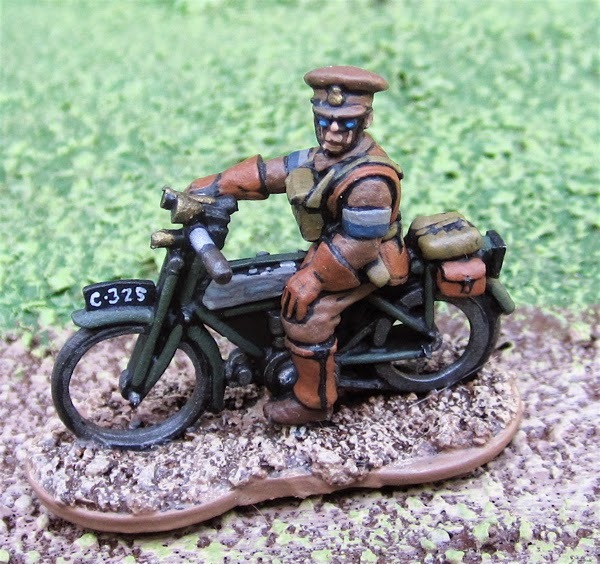 Another entry for the Lead Adventure Forum Great War Painting Club - a British Despatch Rider from Great War Miniatures. 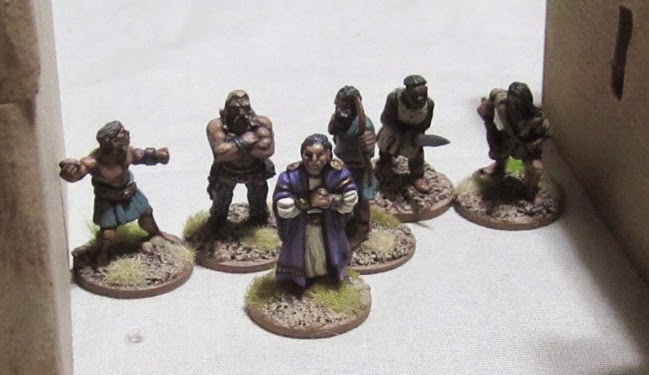 I seem to have loaded up the painting table with Ancient Greeks. There’ll probably be a game report before you see those as I’d told the kids we’d play A Song of Blades and Heroes yesterday, but then didn’t get to that… so hopefully we’ll play this afternoon. An odd assortment of items rolling off the workbench today…. 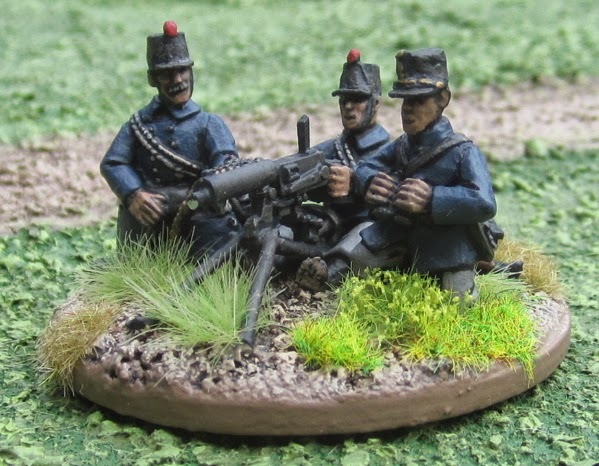 Belgian machine-gunners from Great War Miniatures. 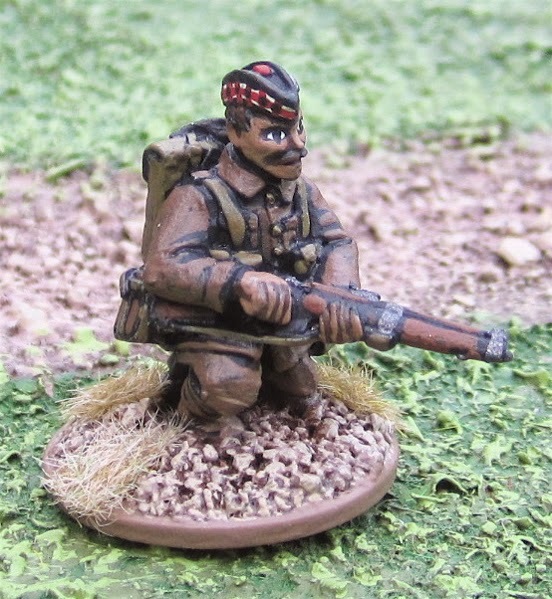 A Scots Rifleman also from Great War Miniatures. 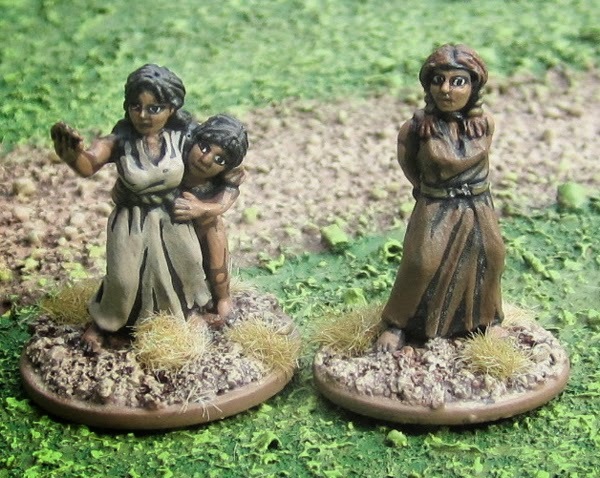 Slaves/captives from Black Tree Design. 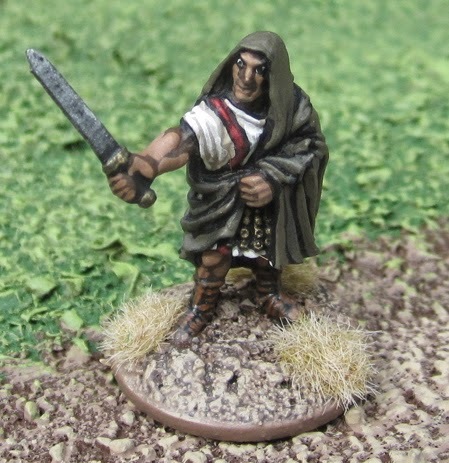 A roman up to no good tha I converted from a Warlord Games figure. 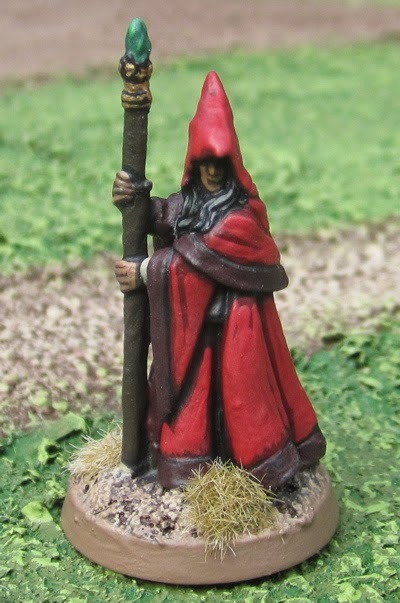 Finally a wizard from Reaper Miniatures. 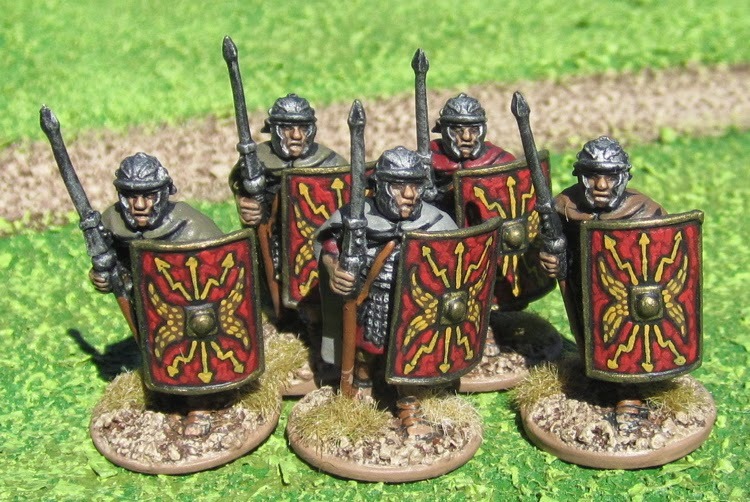 Roman Auxiliary Archers from Black Tree Design. 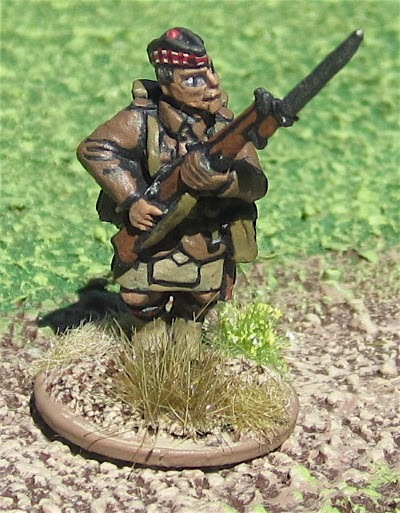 A Great War Belgian Grenadier from Great War Miniatures. More painting… unless I get another game in this evening….? 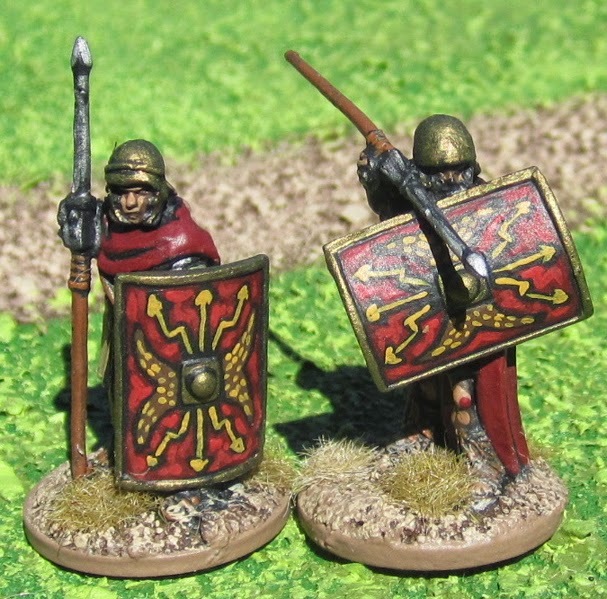 Two more Legionairies – these are from Wargames Foundry, but didn’t come with scutum or pillum so I got some extras from Black Tree Design when I was ordering the last batch from them. 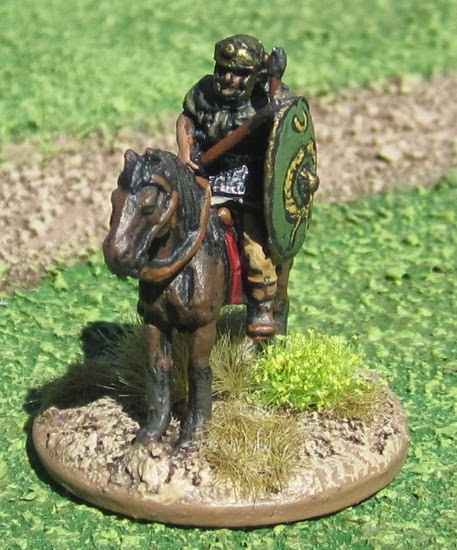 An old, old Roman Auxiliary cavalryman from Citadel Miniatures. Entries to the club are supposed to be single figures. 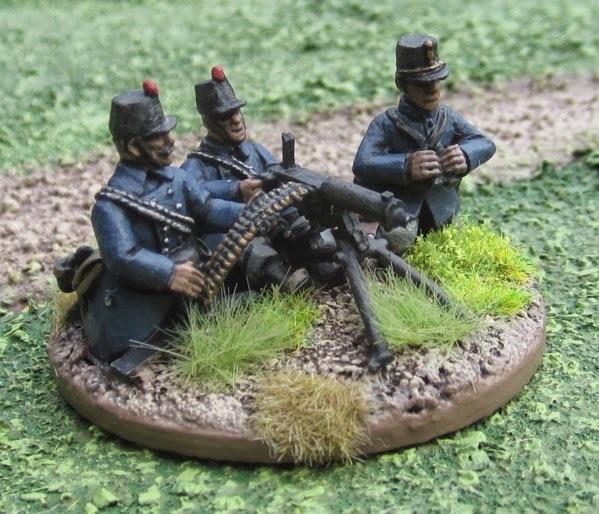 I’m not really used to painting SINGLE Great War Figures… I tend to do them in unit batches of 15-30!? 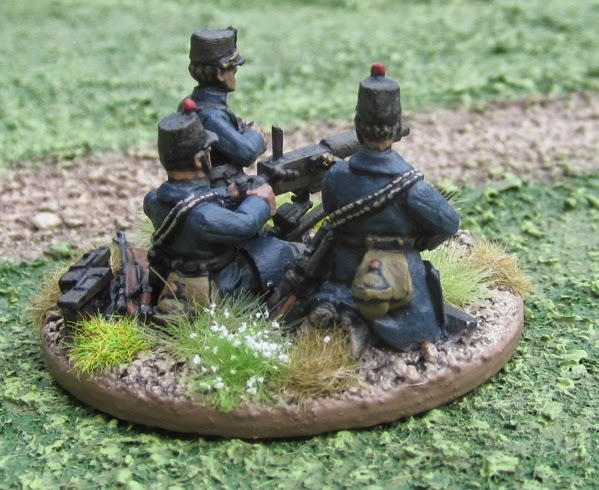 So this was a fun and interesting experience… Perhaps I’ll do an MG team or a gun crew for later in the week – as it counts as a single based “figure”. The kids and I finally sat down to play another game of Song of Shadows and Dust. 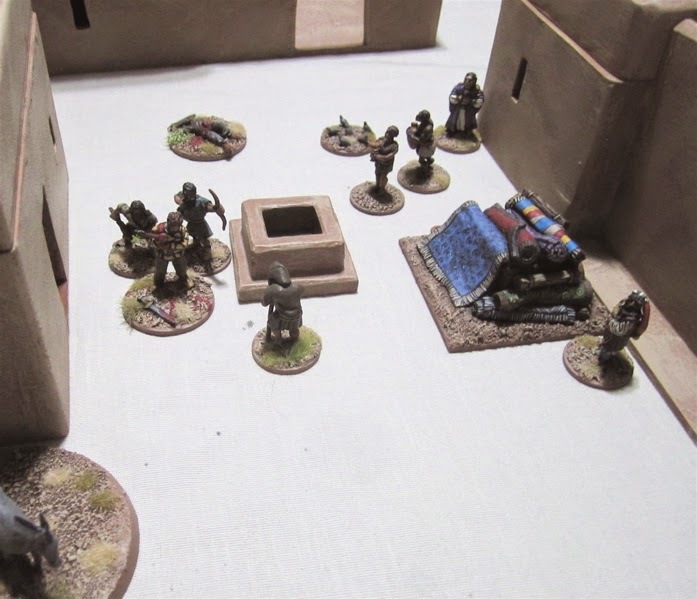 Often I set up games by coming up with two factions, we roll for objectives, set up the game and go… I take pictures and most of the fluff – the background situation, etc. – I come up with afterwards. This time the kids made up their own factions (with my figures) and came up with their own names (or ideas for names – which I them found rough translations for…) and backgrounds for their factions. 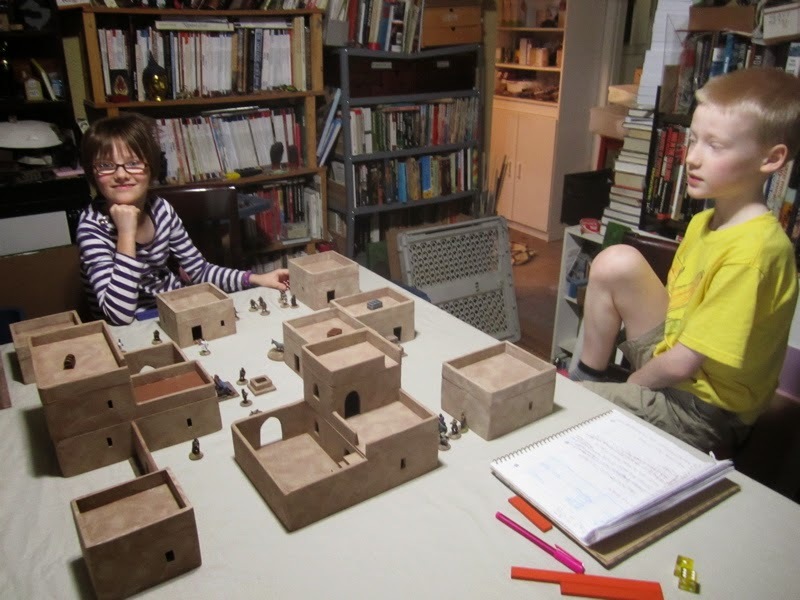 They are both working on assembling and painting their own miniatures for their own factions at the moment – hopefully we’ll see them in action shortly! Magnus Malus Lupus is a rather corrupt property owner in Iskedumdrum. He is not above forcibly ejecting – or even murdering – occupants to take over new buildings. Recently he put an old hag out of her (and his) misery to take over one such building, but is beginning to regret that action. 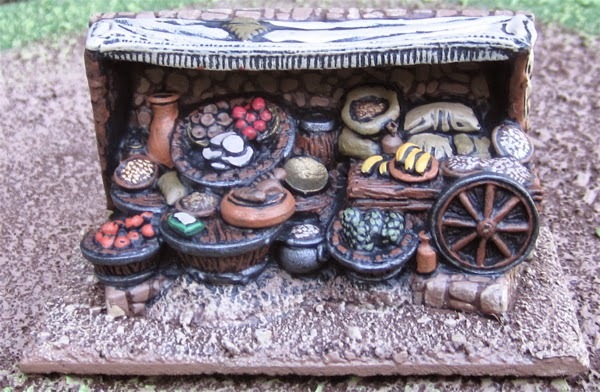 The “old hag” happened to be the grandmother of Rubia Cuculla – a young firebrand not to be trifled with! Magnus Malus Lupus is aggressively trying to take over a few new buildings in a new neighborhood (“Seize the Suburb” objective). 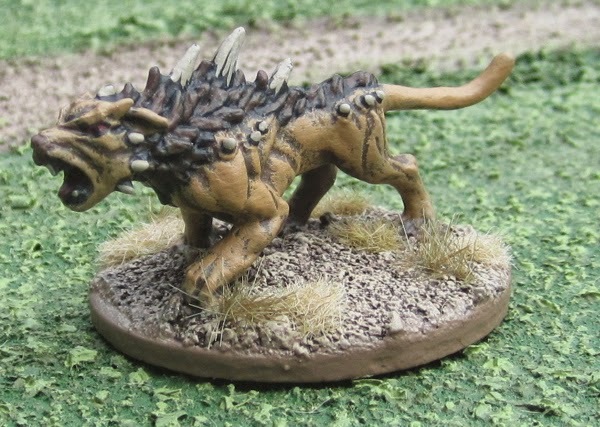 He gets 1 Victory Point per 50 points of defeated enemies, plus one Victory Point for each turn one of his faction is in control of any of the three target buildings, but suffers -1 Victory Point for each turn his rival’s faction is in control of a building. 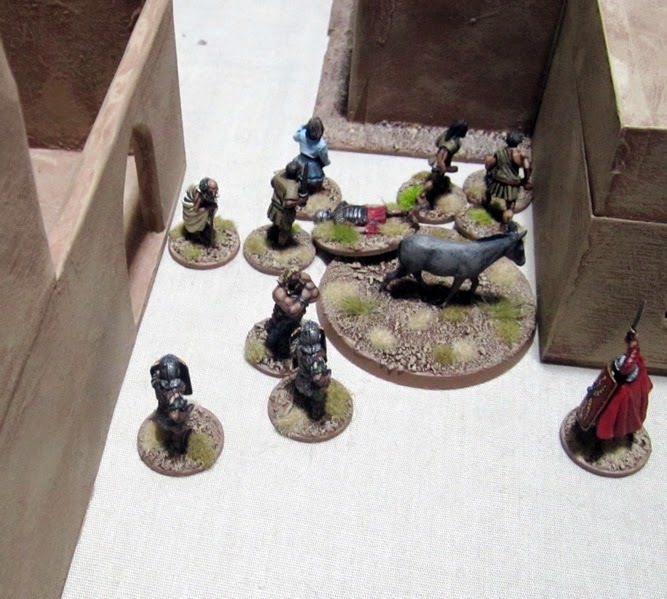 Rubis Cuculla is simply out for blood (“Looking for Trouble” objective). She gets 1 Victory Point per 25 points of enemies defeated. 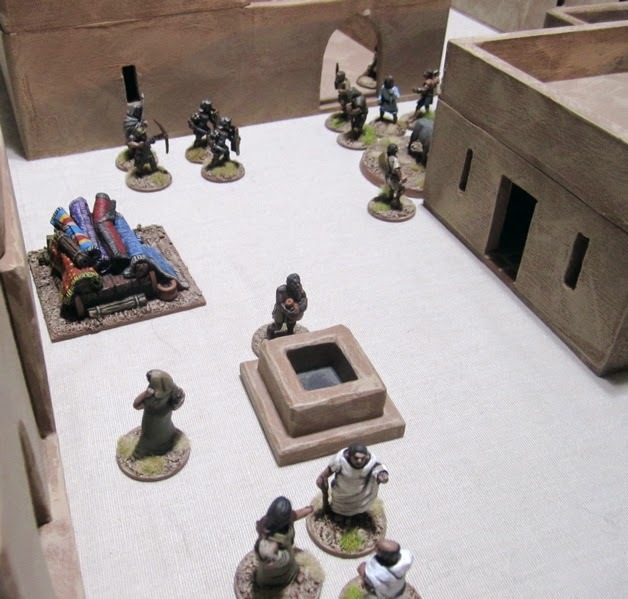 The scenario took place at midday - 12 civilians on the table. 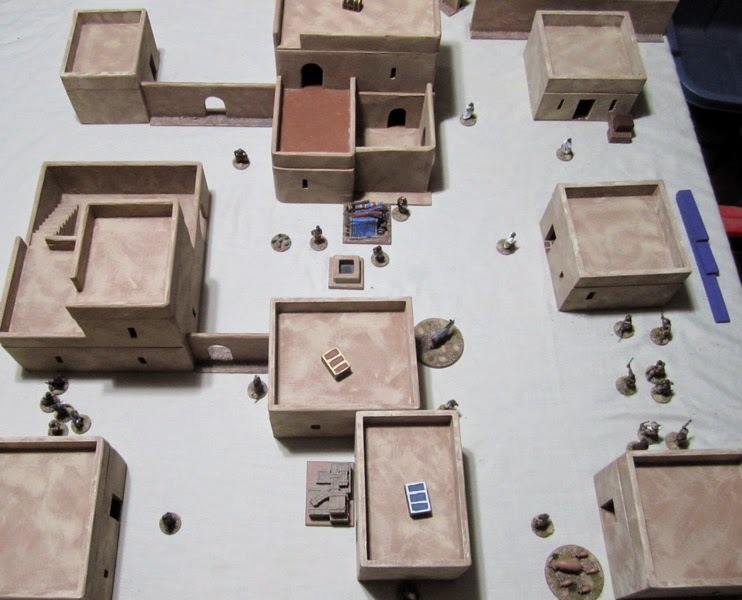 The terrain – as set up by The Girl – for this scenario. 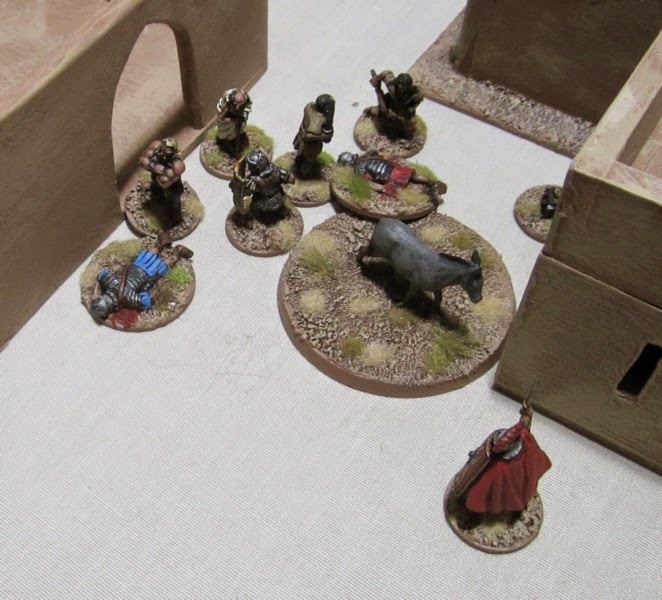 Magnus Malus Lupus and his men are entering the table on the left. Rubia Cuculla and her men are entering from the right. 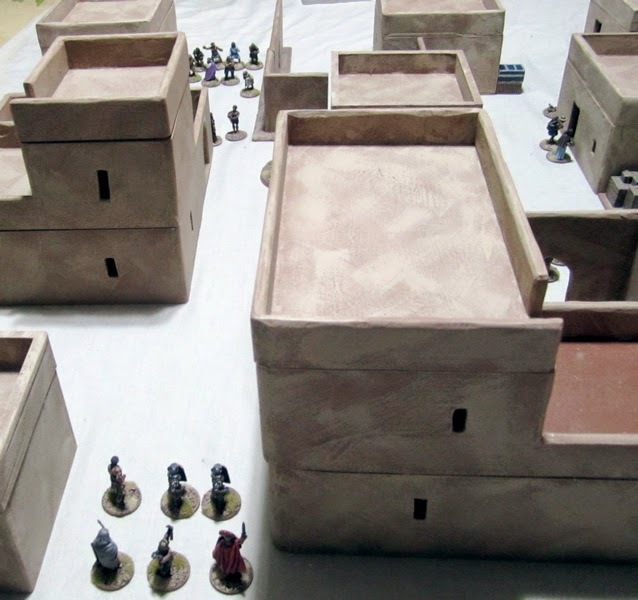 The three target buildings are marked with chests on the roofs. Magnus Malus Lupus looking to expand into an new neighborhood. Rubia Cuculla and her hanchmen ready to spread out to defend the neighborhood. Meanwhile, on The Girl’s end of the turn, she has better luck with the dice and contacts two of the target buildings, putting The Boy 2 victory points in the hole!? Turn two… as before Magnus Malus Lupus rolls two successes. He declines to move any further into the neighborhood without his gang and issues another group move order. The Boy rolls two ones and a four… so the gang catches up. At the bottom of the 2nd turn The Girl gets two guys in contact with the third target building and The Boy is now down 5 victory points! The rest move out into the square by the neighborhood well. 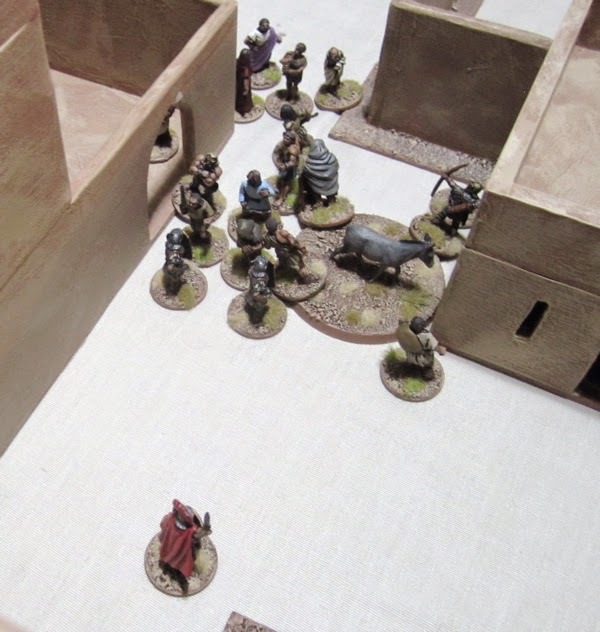 On The Girl’s half of the turn her Cretan Bodyguard knocks down the leading henchman in the group and The Boy is now down 6 victory points…. We began to wonder about that – perhaps he shouldn’t be able to lose more than he’s gained…? Not allowed to go into the negative victory points….? This seemed a little harsh! 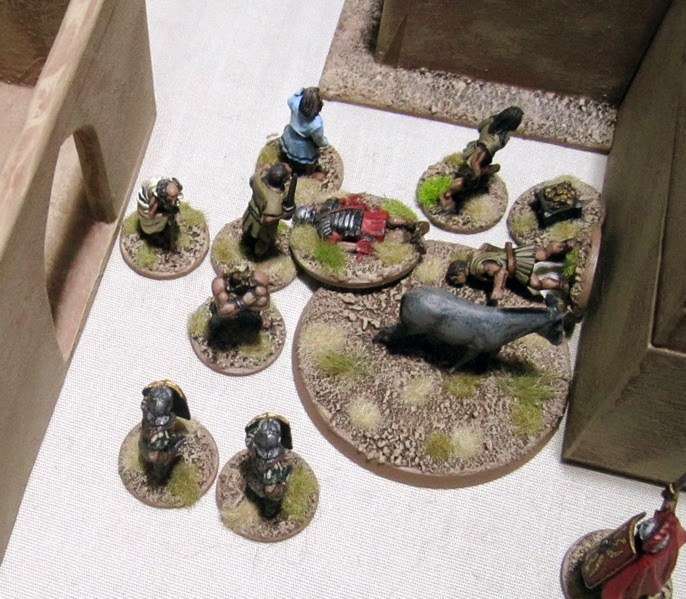 On The Boy’s turn he moves Magnus Malus Lupus once and that ends his and the downed guy what was not able get up was finished off by The Girl’s Cretan Bodyguard. On The Boy’s next turn he got Magnus Malus Lupus in contact with the third building so he would no longer be losing points. 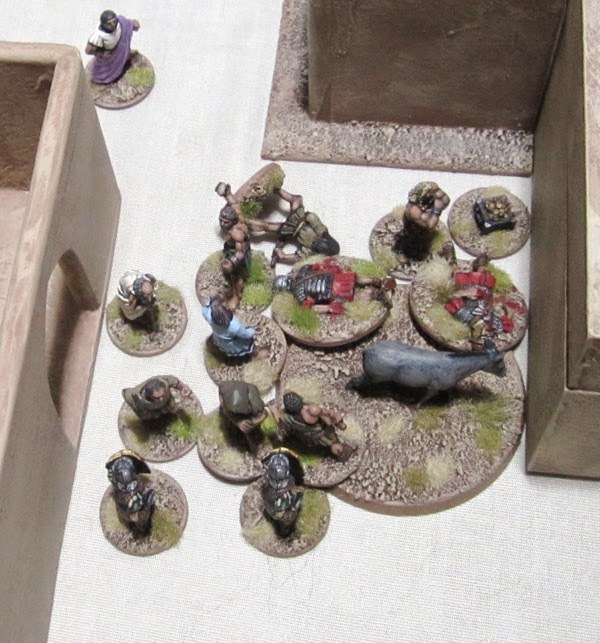 The Gang got one action so The Boy’s Cretan Archer fired back recoiling his opposite. The rest declined to move – partly to stay together as a group. Partly because the Foreign Bodyguard couldn’t move much further anyway otherwise he’d be beyond one long form the leader – something a bodyguard isn’t really supposed to do! 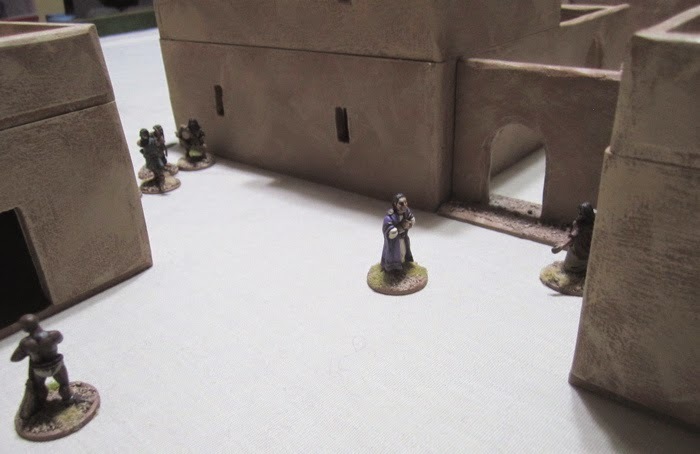 At the bottom of the Sixth Turn The Girl’s Cretan Bodyguard took down The Boy’s Foreign Bodyguard (and moved up her Blind Prophet). 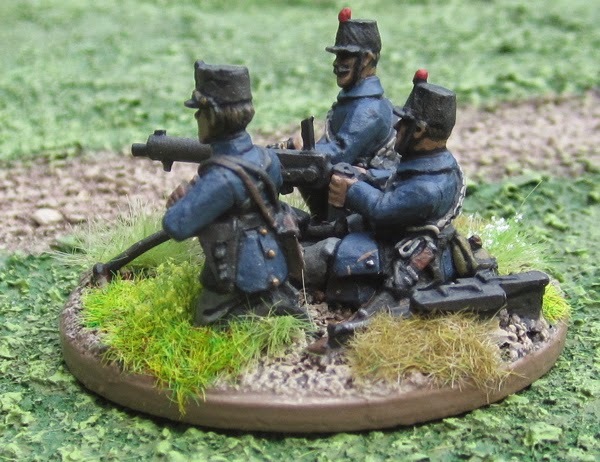 The Boy, seeing no way out of this mess, conceded and fled the field with is remaining four faction members – dragging the bodies of the two fallen members with them… as it turned out the Foreign Bodyguard was seriously injured, but made a miraculous recovery and gained the Lucky special rule! The Henchman was not so lucky – his serious injury left his leg permanently crippled and thus gained the Short Move special rule. 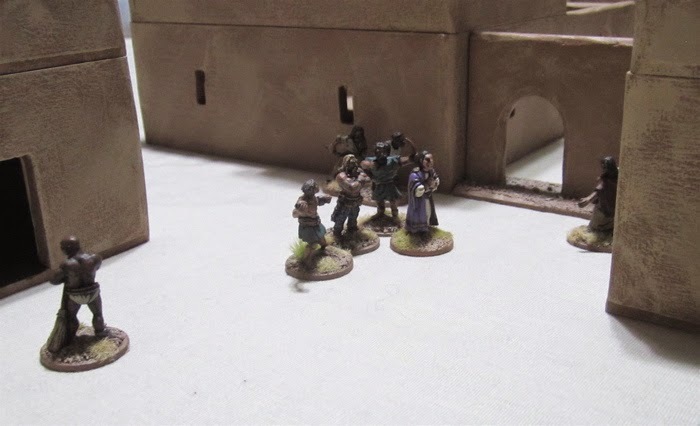 The Girl Scored 7 Victory Points – 4VP for the faction members that fled the field and 3VP for the 78 points worth of foes her forces took out. I had kind of wanted them to, despite all the wonderous toys I have available, design a faction with figures that I have that they would be able to make with the figures they have – so they could see how it works out. The boy, as I had kind of predicted, took a small number of high-point, hard-hitting brutes… which, I’m hoping he realizes, was PART of his downfall here. 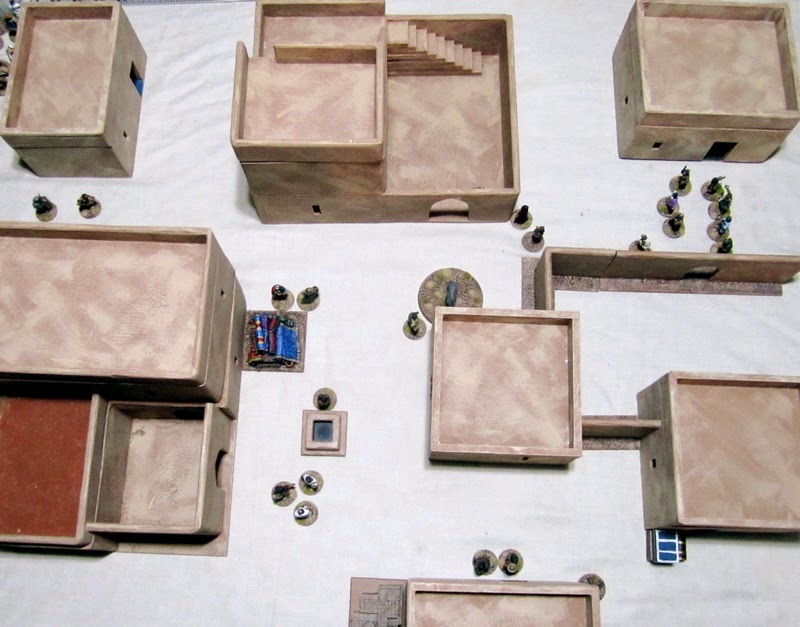 I like “Seize the Suburb” it forces players to split up their forces and prevents a simple brawl in the center of the table… sometimes… You do need numbers to do this, though – enough to contest all three, with a large enough group of others to go clear off enemies from one building to start scoring Victory Points. 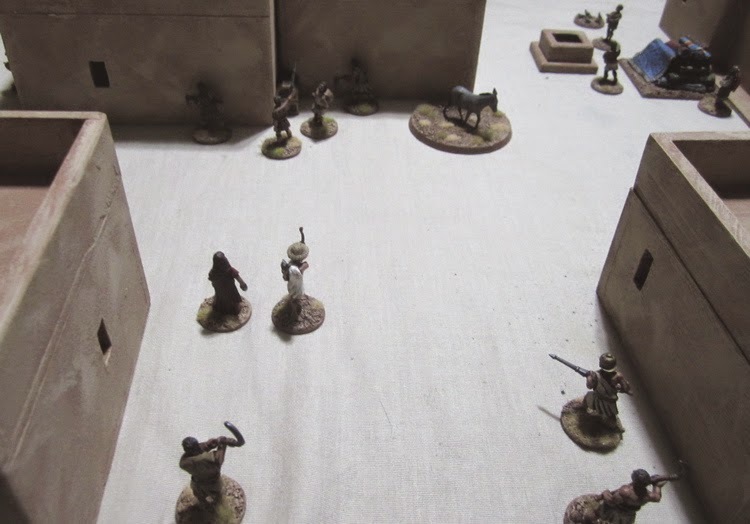 As the last week of our summer wraps up I’m hoping we’ll get in a few more games – next I’ll probably get them to try building some different warbands with their fantasy figures as we’ll be running a Song of Blades and Heroes/Song of Deeds and Glory campaign starting in September. More games. 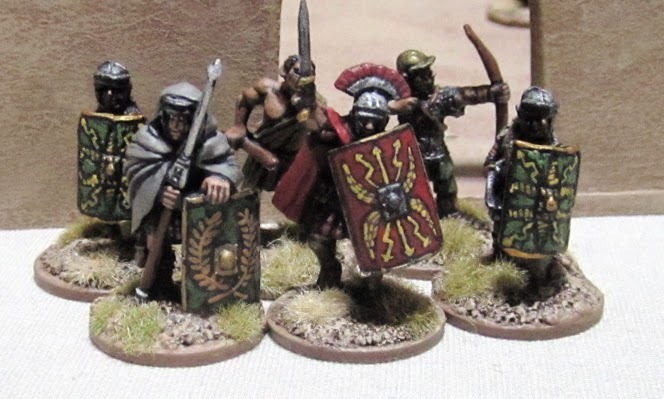 More figures painted – I have a bunch of Roman Legionaries I’m just finishing up. My friends Dave and Patrick stopped by Thursday evening to try out Song of Shadows and Dust. It’s been a busy few days and my memory of exactly how things went down, turn to turn, is fading quickly… but I’ll do my best to relay the highlights of the action! Publius Vindicus Consultus is a young magistrate in Iskedumdrum. He is determined to root out corruption within the militia. He wants to make an example of Malus Legatus! 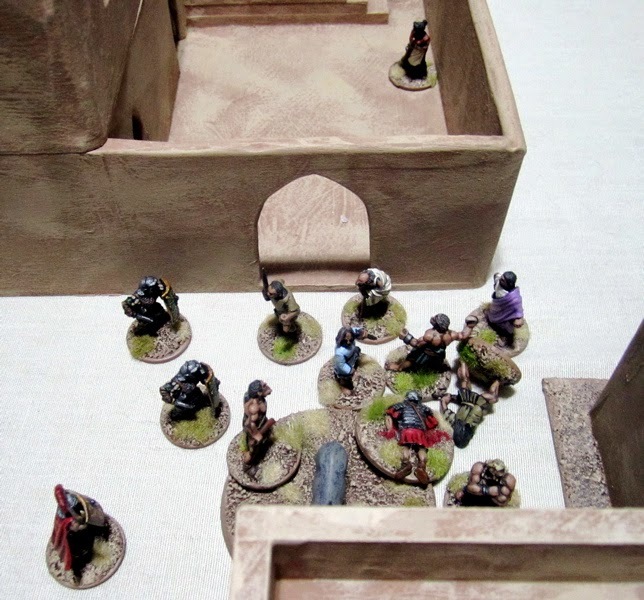 Mad with power, Malus Legatus has become brazen and believes himself untouchable – he is at the point where he is even willing to risk open confrontation with the magistrates men in the streets.. The magistrate needs hard evidence and has decided to try and capture one of Legatus’ men to be tortured and interrogated. They score 1 Victory Point for every 50 points of opponents defeated and a bonus 5 Victory Points if they can capture and drag one of Legatus’ men off their own table edge. Malus Legatus is out to teach the neighborhood why you don’t mess with Malus Legatus. They only score 1 Victory Point for every 100 points of enemies defeated, but score 10 Victory Points if they can retrieve a bee hive and deposit it in the building of a businessman that’s been a little behind in paying his “protection tax”. 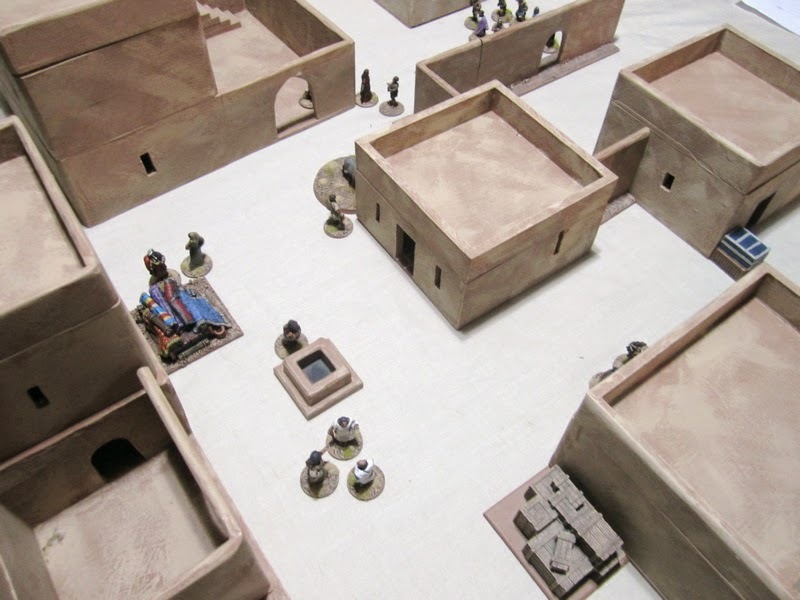 The scenario takes place in the scorching heat of midday – only 12 civilians are in the street. Rolling for his Heavy Drinking Body Guard – Patrick found his drinking today had made him a Combat Master!! The setting for the action. The behive is tucked in the carner behind the irritable mule and the target building is the one at the bottom right of the picture (with the chests stacked against it). The magistrate’s men can be seen entering from the top right. A few of Malus Legatus’ men can be seen at the top left. 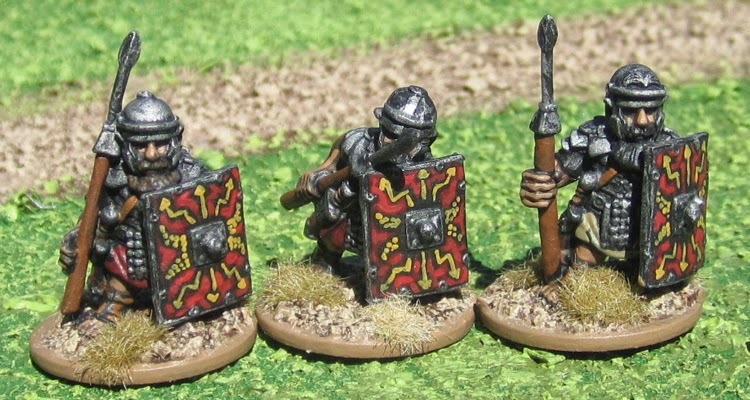 Malus Legatus spots that meddling Vindicus Consultus and his men approaching. Innocent civilians standing about the square unaware of the confrontation about to take place. The standoff in the street. 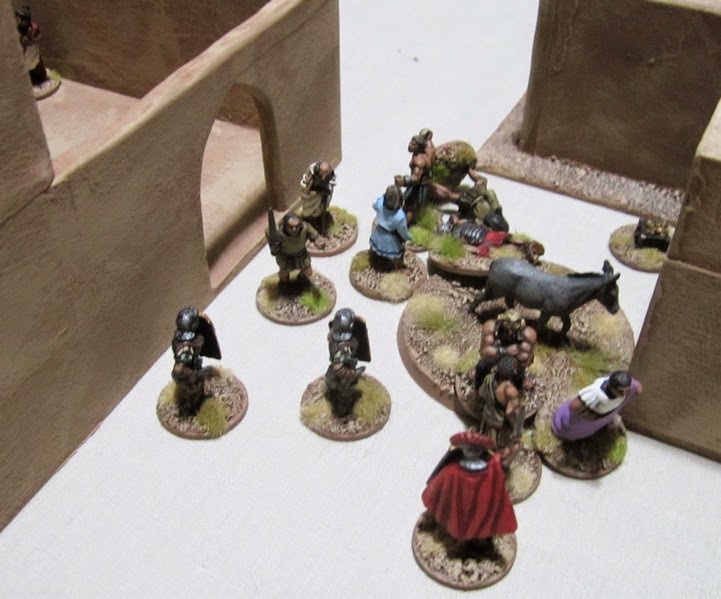 Legatus’ men rushed in trying to block the magistrate and his men from advancing further so the militia archer could get to the beehive in the corner. I can’t quite remember who struck the first blows… I think it may have been the Magistrate’s men. The civilians – that Patrick had hoped might join his cause – scattered. 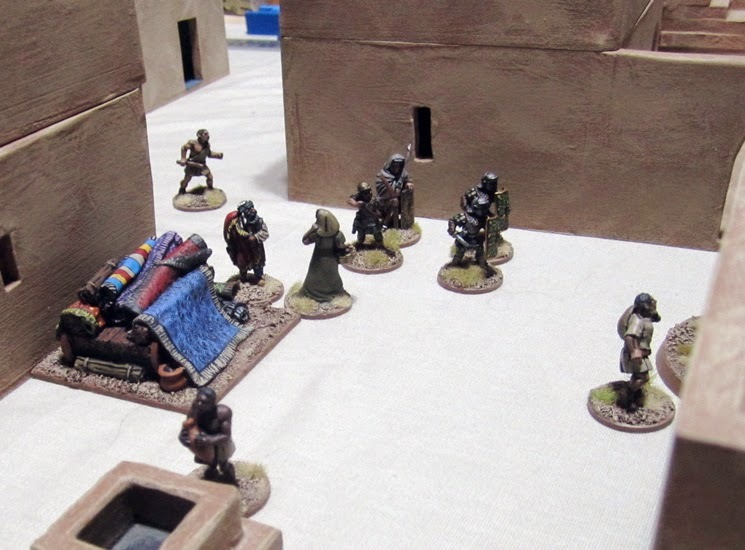 The Veteran Militiamen was the first of them to go down – clonked on his head and knocked out cold. 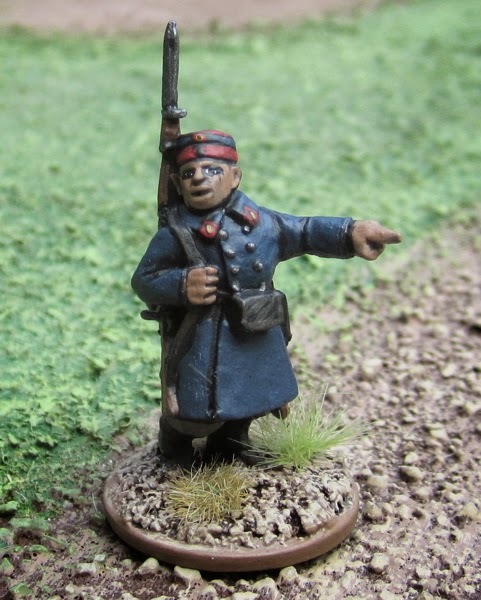 This Patrick decided would be his target for capture – Legatus’ Right Hand Man. 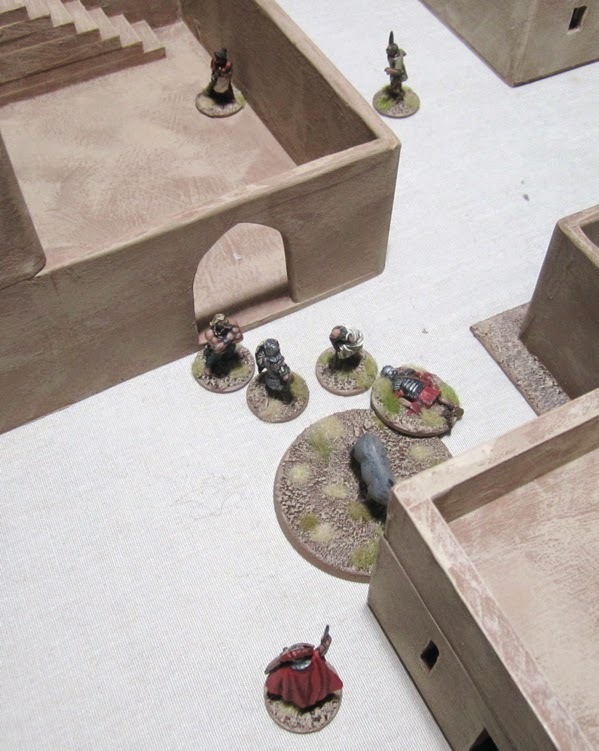 Frantix, the Foreign Bodyguard of the magistrate, also took down the Milita Archer before he could get to the hive. 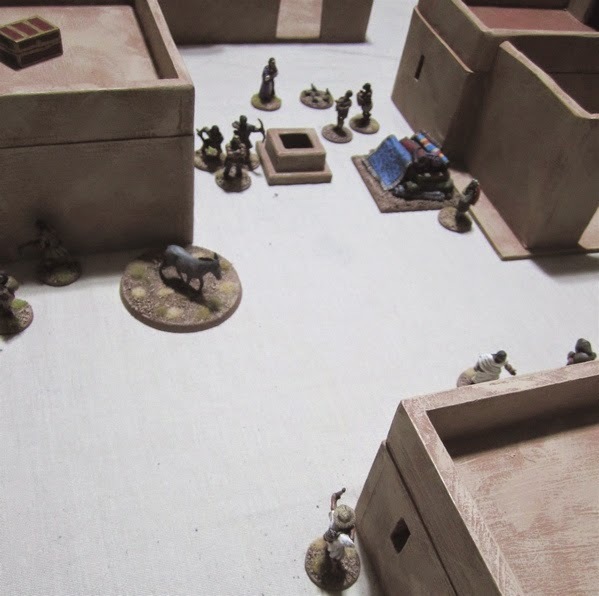 There was a little confusion about the details of how capturing someone worked… in the rules is explains that at any point during the player with the Abduction objective could choose to change a kill result to a fall, it then took two action to bind and lift a captured enemy… it also said that if the carrier was attacked that a captured enemy would be dropped and should be placed lying down on the table and could then get up…?! 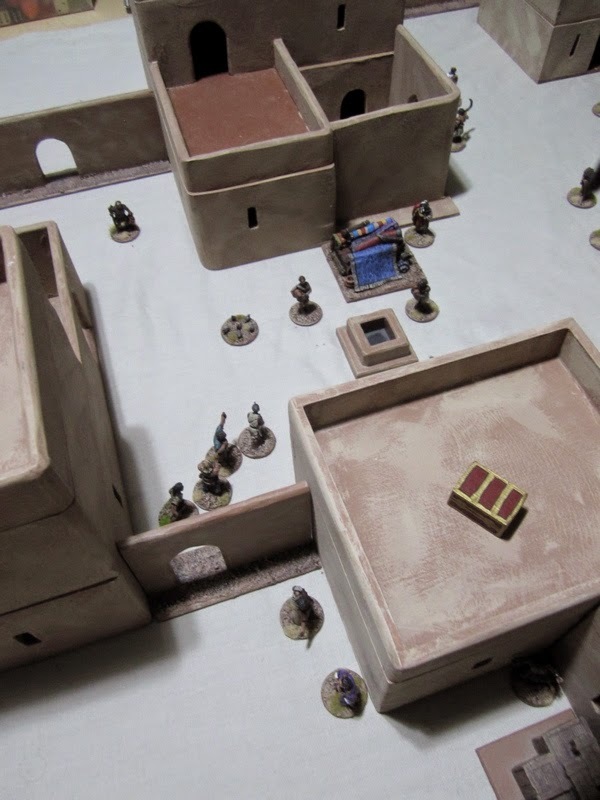 So we weren’t sure if ANY fallen opponent (beaten, even roll on dice) could be captured – as long as there was a standing rival in contact with him that could spend two actions to bind and lift them? Or did they HAVE to get a “kill” – which would then be considered “knocked out” who could be bound and carried off at the player’s leisure. If a captured person was dropped an did manage to stand up were they automatically unbound and able to fight again normally? How would they have gotten their weapons back? 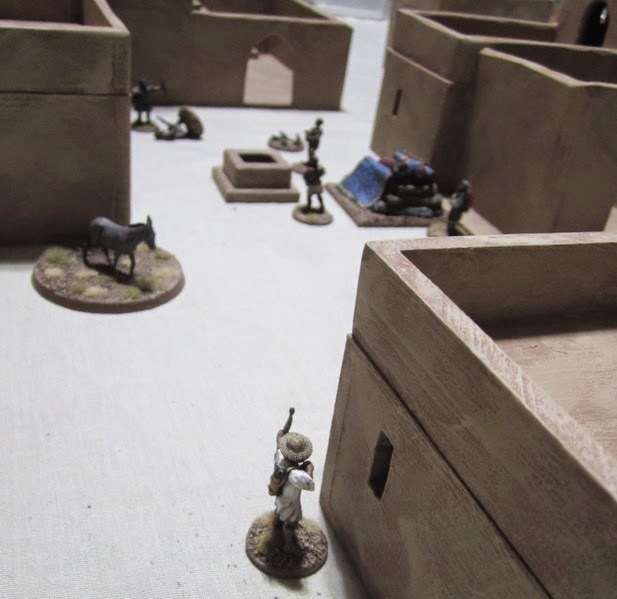 To keep things simple for the evenings scenario, I said that the abducting player had to score a “kill” result (doubled) – but not “gruesome kill” (tripled) – to “knock out” someone. One action was required to bind them, a second action was required to pick them up or grab them to drag away. 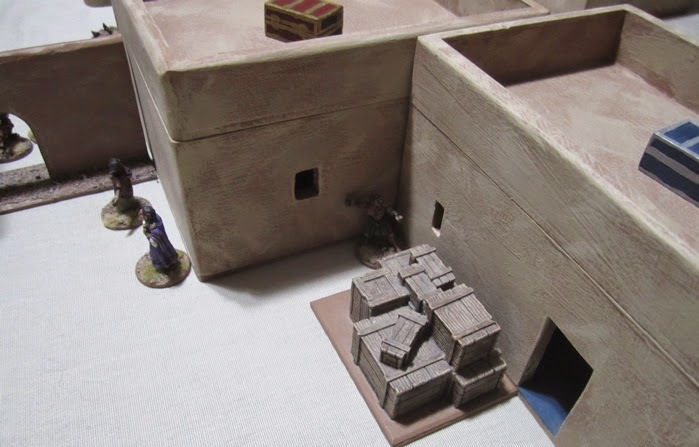 If they were then contacted they would drop the captured opponent, but once captured the opponent was essentially just a marker (as in the Rescue objective) that either side could “pick up” for an action and drag or lead away as they see fit. 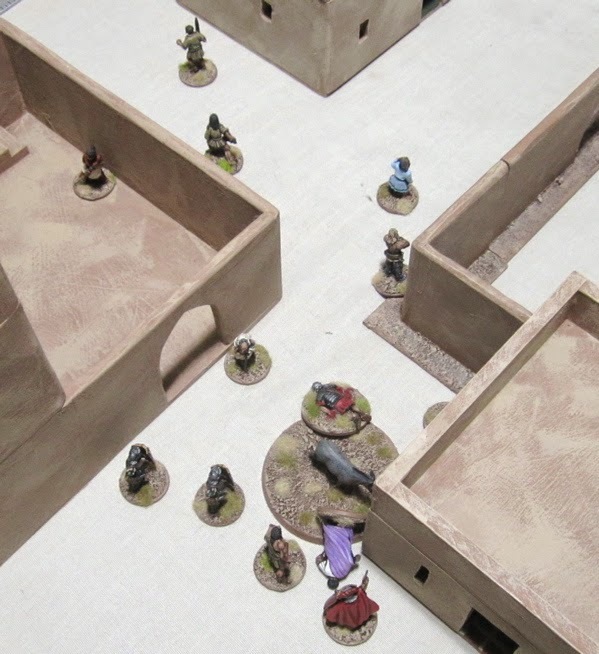 For some reason Vindicus Consultus decided to push through the melee into the square – perhaps he wasn’t feeling much use loafing about in the back – and so decided to march into the square and try to rouse the citizens against the corrupt militiamen. But close enough to his own men to cause most of them to flee! Things were looking pretty bad for the Magistrates men. 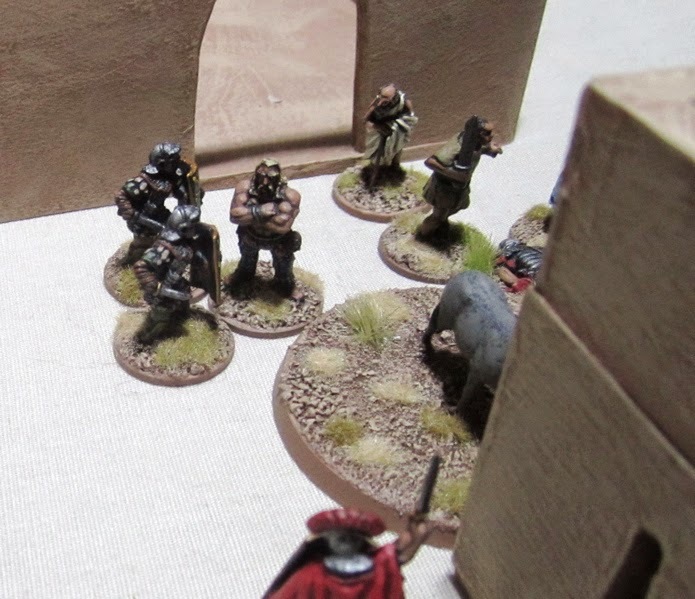 Frantix the Foreign Bodyguard, mad with rage, took on TWO militiamen! 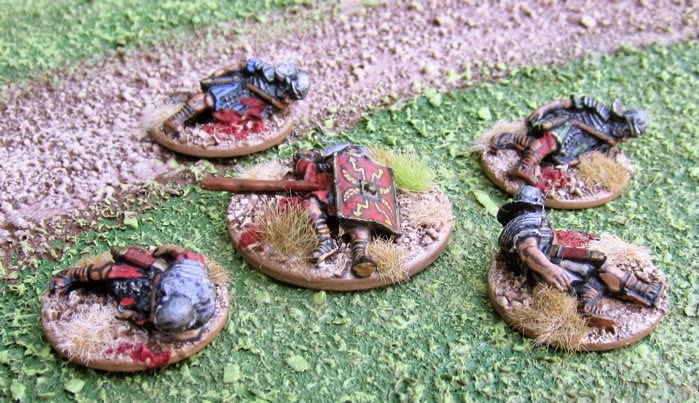 Which unleashed a swarm of angry bees… Malus Legatus and one of his militamen were knocked down by this – rolling about on the ground trying to get angry stinging bees out of their segmented armour! In the end, three of the magistrates men had fled the table and one henchman had been cut down along with the magistrate himself. 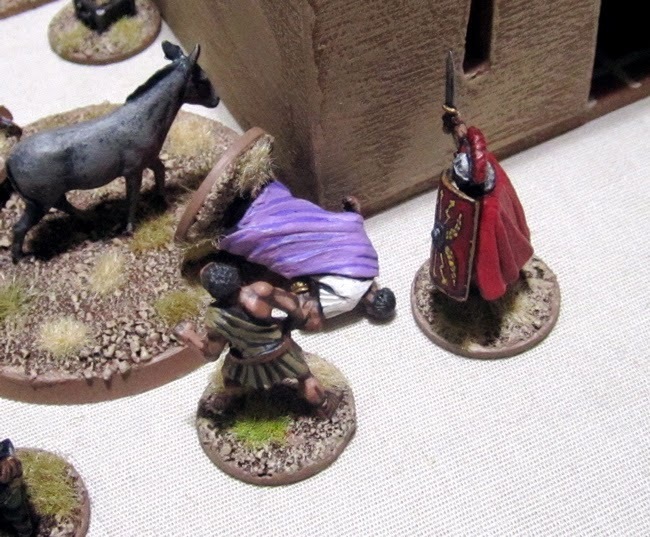 Just over 200 points worth of troops defeated or fled netted Malus Legatus 2 victory points… Checking afterwards, the Henchman died of his wounds, but Magistrate Publius Vindicus Consultus luckily escaped serious injury and apparently the Fortunes smile upon him because he gained the “Lucky” special rule! 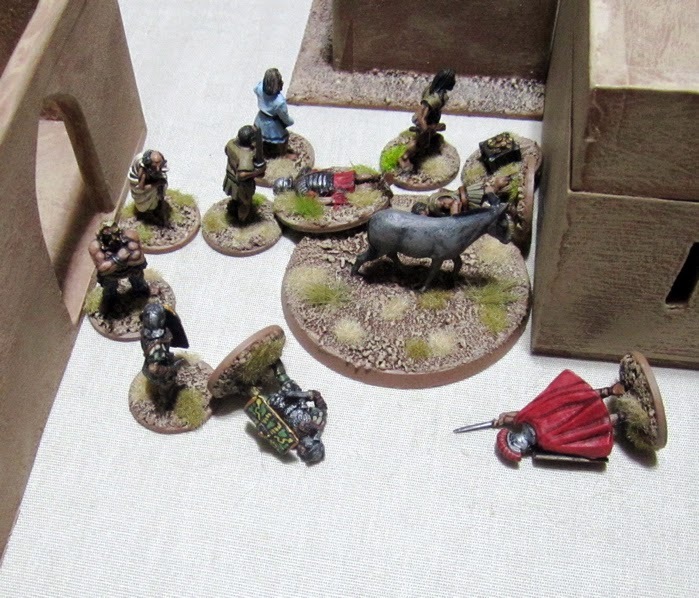 Malus Legatus had lost two militamen, the archer and his henchman (the one we decided was an “informer”). Enough to give the magistrate 3 victory points! 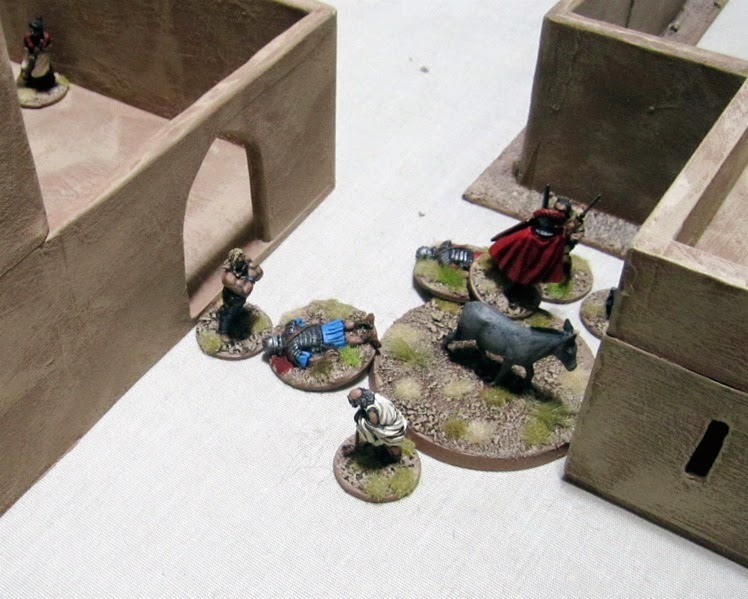 The archer, the hemchman and one of the militiamen all died. The remaining militiaman was seriously injured and would suffer a permanent -1C. The kids are asking to play a Song of Shadows and Dust game today – perhaps there’ll be a second game report posted later this evening!